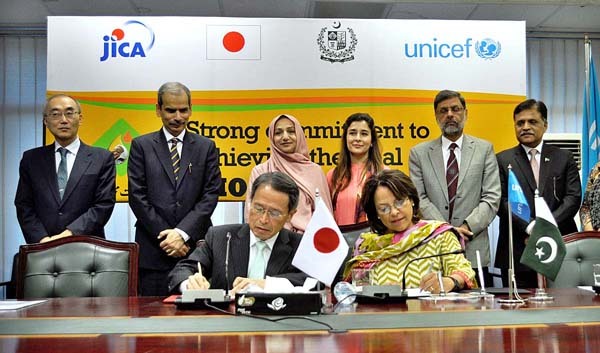 ISLAMABAD, Oct 18 (APP):Ambassador of Japan to Pakistan, Takashi Kurai and Acting Country Representative of UNICEF Pakistan, Cristian Munduate have signed a grant agreement at the Ministry of National Health Services Regulations & Coordination here Wednesday. According to the Japan Embassy, Minister for National Health Services Regulation & Coordination, Saira Afzal Tarar also attended the signing ceremony. The Government of Japan has announced to provide a grant of 520 million Yen to assist Pakistan’s efforts for Polio Eradication campaigns during 2017-18. Minister for National Health Services Regulation & Coordination, Saira Afzal Tarar, Prime Minister’s Focal Person for Polio Eradication, Senator Ayesha Raza Farooq, Secretary, Ministry of NHSR & C, Naveed Kamran Balouch and Chief Representative, JICA in Pakistan, Yasuhiro Tojo also witnessed the signing ceremony.